A young woman drives to the edge of a cliff in London and jumps off commiting suicide. Hundreds of miles away in Rome, Italy, her daughter sees this taking place in her mind. She is a clairvoyant. Years later, we meet the young girl as she is now. 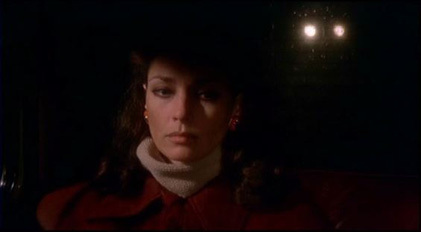 After dropping her husband (Gianni Garko) off at an airport Virginia Ducci (Jennifer O'Neill) makes her way back to their home, but as she drives through the country roads, she begins to have visions once again. She sees images of an older woman with blood on her head, a beautiful young woman on a magazine, a broken mirror, a lit cigarette and a man limping in the dark. She is frightened. Fulci uses a special zoom into her eyes whenever these visions come to her. Virginia finds herself back at her home, she is half asleep and a man tells her to wake up. Virginia talks with her psychiatrist Luca Fattori (Live Like a Cop, Die Like A Man's Marc Porel) about her visions, and she claims she's seen a murder from the past. Her doctor asks her why she is coming to him instead of the police. Virginia lets him know that she trusts him more and that the police probably wont believe her. Virginia continues to have visions of a house and a woman being trapped behind a wall. She leaves to goto her husbands's old villa to try to restore it. While shes in one of the rooms she sees that this is the very place she saw in her mind. She sees that this wall, is the one where the woman was bricked up, so she takes a large pickaxe and begins to break the wall open. In the next scene, we see she has found a skeleton inside the wall and the police are taking pictures. Now they need to find out just who the dead person is. The police find out that the woman found in the wall was around 25 years old. Virginia tells the police that the dead woman she saw in her vision was alot older, around 50. They are all confused by this. The police have no choice but to take Virginia's husband into custody because he owns the villa. The next day, the Italian paper has his name all over the front page. Later, Virginia receives a mysterious call from an older woman telling her she has info about who really killed the young woman in the wall. Virginia realizes that the young woman who was murdered must be the one from the magazine. She gets a copy of the magazine from 1972 with the young woman on the cover and it turns out its from an equestrian magazine. She finds a clue on the cover connecting it to her visions of the older man. She comes to the conclusion that it is a local equestrian owner named Giovanna Rospini (Salvatore Puntillo). The clues are coming together nicely. Virginia decides to go visit Rospini at his home. She introduces herself as a reporter from the New York Times. When Virginia asks Rospini if he had anything to do with the woman who was killed, Rospini gets really angry and tells her to get out of his house. Virginia now suspects that he really is the one who killed the girl. It turns out that her husband is found innocent because the woman who died was killed while her husband was out of the country as Virginia's idea stated. The proof she finds is right on the cover of the equestrian magazine taken during a horse race. Virginia is able to get her husband out of jail, but her psychiatrist later finds that the cover of the magazine has a hidden clue that destroys Virginia's original theory. This is where the film takes a big twist and as time ticks on to the sounds of Virginia's Seven Notes Watch, things get even more thrilling....and deadly. The climax of the film is brilliantly executed and the last shot of the film is stunning. Seven Notes in Black is really one of Fulci's finest works of cinema not because it contains alot of violence or gore, but because its restrained and more about plot than anything else. It works like a puzzle to intrigue the viewer into trying to figure things out, but its not even a typical Giallo. Its a unique work that Giallo fans will really find captivating. You may have heard the theme to Seven Notes in Black sampled in Quentin Tarantino's Kill Bill: Volume 1 during Chapter Two: The Blood Splattered Bride. Tarantino uses the theme as both a tribute to the film and a way to evoke the mood of the Giallo genre. One thing fans of Kill Bill may also notice is a resemblance between Jennifer O'Neill and Uma Thurman. Strange isnt it? This page was last edited on 28 May 2007, at 16:04.